This picture is from The Corn Exchange‘s production of Dubliners, which was running recently as part of the Dublin Theatre Festival. It’s an adaptation of Joyce’s short story collection of the same name and consists of dramatisations of 9 of the 15 stories contained in the book. 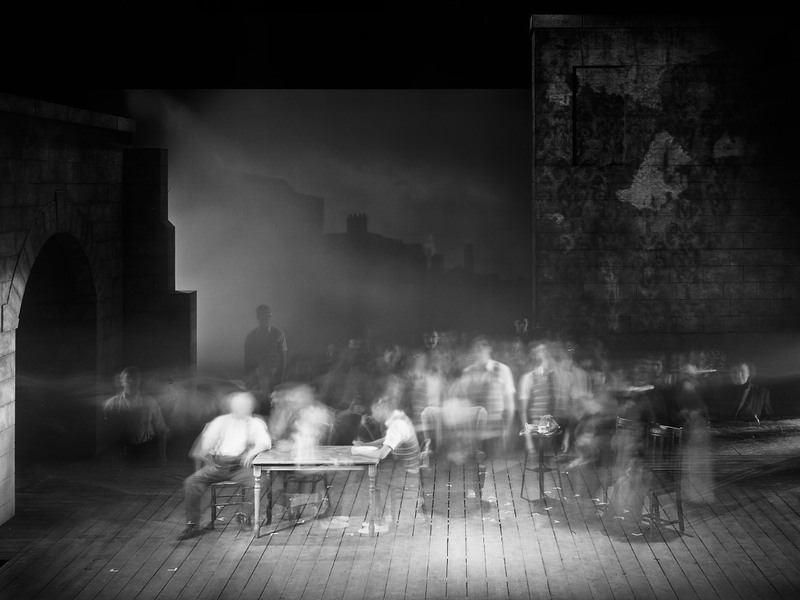 The photograph is a 16 minute and 50 second exposure of the first scene of the play, which is the story The Sisters, also the opening story in Joyce’s book. The story is about a boy and his relationship with an elderly priest who, after having just suffered a third stroke, is about to die. The boy, anxiously waiting for news, is then casually informed of the priests death while at dinner with his aunt and uncle. It transpires that the priest had been schooling the boy in the ways of the church and they had formed a close bond. This situation was something that the boy’s guardians did not wholly approve of, as the priest was in a state of disgrace, after having suffered some sort of mental breakdown some years back after accidentally breaking a chalice. All of this is revealed by means of somewhat elliptical conversations, primarily between his aunt and the priest’s two sisters, who they go and visit at the end of the story. The whole story is rife with spectral presences, dreams and death. The dead priest appears to the boy in his sleep that night, and later the boy reminisces about all the priest taught him – the arcane rituals of the church, Napolean and the catacombs, the secrets of the confessional. The priest, both in life and in death, is portrayed as a slightly hideous and frightening figure, with his foul snuff habit, his cavernous nostrils and discoloured teeth. We never meet the priest when he was alive, and so it’s tempting to imagine that he never really was. Even the boy seems to drift through the story like a ghost – no-one directly addresses him and the others speak of him as if he’s not really there. Of course I could be projecting all this onto Joyce’s story based on the photograph. It has been suggested to me before that these pictures are reminiscent of a form of spectral photography: a mechanism for attempting to capture presences on film, a means of giving access to some sort of plane of being that we are not normally privy too. We can think of ghost-hunters setting up cameras in supposedly haunted houses that repeatedly shoot pictures all through the night in the hope of capturing a spectre. This seems ludicrous, and it’s easy to dismiss any positive results of this type of thing as being, if not blatantly faked, certainly explicable in terms of tricks of the light, artifacts of the lens, something to do with the exposure, and so on. However, what if we think of ghosts not as presences from beyond death, beings from another plane, but as manifestations of dislocations of time? Imagine if you had a sort of radical mental disorder that meant you experienced time differently to everyone else. Imagine if things were infinitely slower for you than for other people around you. Imagine if 16 minutes and 50 seconds seemed to pass in an instant and that it was compressed into what seems like a single moment. Would everyone around you not seem like fleeting presences that are barely there, or in other words, would they not be like ghosts? You would be unable to communicate with them but you would be aware of their presence. They might call to you but you would be unable to respond fast enough to form a connection. If we think of ghosts as involving this sort of distortion of time then certainly the photograph above might be a reasonable depiction of what that might look like. This connection between ghosts and time was used by Jacques Derrida in his book Specters Of Marx. Taking his cue from the first line of the Communist Manifesto where Marx and Engels said that “a spectre is haunting Europe, the spectre of communism”, Derrida suggests that in spite of the so-called end of history proclaimed after the fall of the Berlin wall, the spirit of Marx will return to haunt us. Of course he doesn’t literally mean that old man Marx will start appearing at the ends of our beds in the middle of the night, but rather that while communism might be dead, the historical ideas and ideals that inspired it will return and can potentially manifest themselves in new ways. He invented the term hauntology to capture this notion of how things from the past can continually reappear in our present. There’s a sense of the uninvited about it: it’s not a case of actively uncovering and seeking to be informed by what happened in the past, but rather things from the past imposing themselves on our present, whether we like it or not. 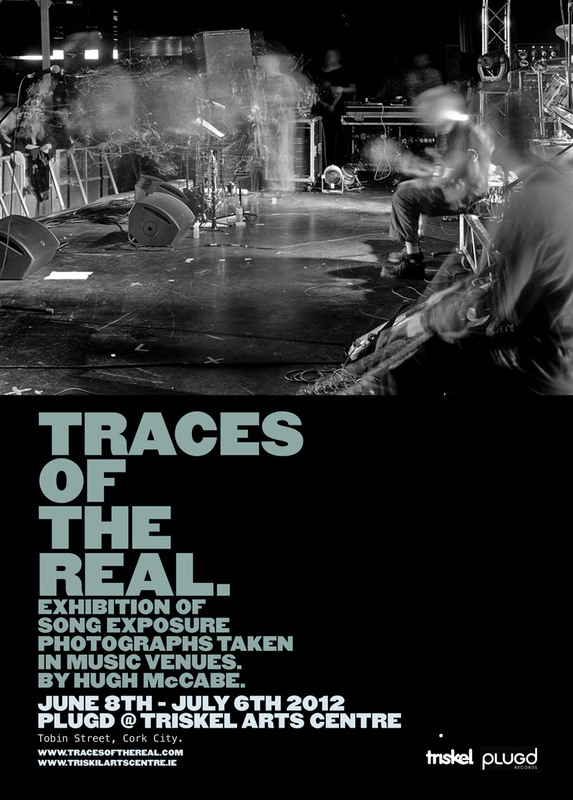 The term hauntology was later picked up by music writers like Simon Reynolds to try and capture that glitchy, scratchy, ghostly sound of genres like dubstep; music that samples sounds from the past and shoves them into contemporary contexts, resulting in a kind of dislocated temporality. Okay, this seems like an appropriate moment to stop and listen to the song Ghosts by Japan, if for no other reason that it’s great. I’ve just noticed that the photograph on the cover of their album Tin Drum, from which the song is taken, itself contains a faded, peeling photograph of Chairman Mao. I’m sure Derrida would approve. Thanks to Claire Howe and Annie Ryan for facilitating making this photograph at The Dubliners happen.